Okaw Valley won the school’s first regional championship in 2017 and is looking for even bigger things in 2018. Last season’s highlights: 4-29 overall, lost 25-14, 25-18 to Aurora Christian in a Class 2A regional semifinal. 5-8 junior outside hitter Molly Kurtz, 5-6 junior outside hitter Ellie Nugent. Top newcomers: 5-7 sophomore rightside hitter Emma Valant. Outlook: Look for senior defensive specialist Kenna Kleinhert to be the leader on a young Fightin’ Irish team under the guidance of a new coach. Last season’s highlights: 25-7 overall, 14-2 in conference (second place), lost 25-18, 25-20 to St. Charles East in a Class 4A sectional semifinal. Top returnees: 5-6 junior setter Taylor Jakubowski, 5-9 senior outside hitter Julia Johnson, 5-10 senior middle blocker Loren Alberts, 5-6 senior libero Sarah Zayas, 5-6 junior defensive specialist Josie Schmitendorf, 6-0 junior middle blocker Marissa Deem. Top newcomers: 5-9 senior outside hitter Natalie Gzynski (out with torn ACL last year), 6-0 junior middle blocker Kathryn Bower. Outlook: Huntley ranks as one of the favorites in the always tough Fox Valley Conference along with Prairie Ridge and last year’s IHSA Class 4A third-place finisher Crystal Lake Central. Did you know? Julia Johnson has committed to West Point, where she will join a pair of current Cadets from Illinois – sophomore libero Maggie Peterson from Metea Valley and freshman middle hitter Emmi Barnhorst of Wheaton North. Last season’s highlights: 35-5 overall, 8-0 in conference, lost 25-21, 25-16 to eventual state champion Marist in a Class 4A supersectional. Top returnees: 5-9 senior setter Nancy Kane, 5-8 junior libero Lexi Warfield, 5-10 junior rightside hitter Amia Owolabi, 5-9 junior outside hitter Alena Pedroza, 5-8 junior defensive specialist Grace Niego. Top newcomers: 5-8 sophomore outside hitter Connie LeBel, 5-6 sophomore defensive specialist Anna Jaworski, 6-0 sophomore rightside hitter/setter Molly McDermott, 6-1 sophomore middle blocker Molly Boyd. Outlook: McAuley, which has won more state titles than any other team in Illinois (13), does not rebuild. The Mighty Macs reload. Despite their youth and the graduation of all-world Charley Niego, the Mighty Macs still figure to be right there at season’s end contending for another state championship. Did you know? Mother McAuley was the only team in Illinois to defeat eventual state champion Marist in 2017. Last season’s highlights: 15-14 overall, 4-3 in conference, won school’s first regional championship, lost 25-16, 25-9 to (Louisville) North Clay in a Class 1A sectional semifinal. 5-2 junior libero April Decesaro, 5-9 senior middle hitter Kailynn Bobbett, 5-2 senior setter Sadie Zimmerman, 5-11 senior middle hitter Madison Vogel, 5-7 senior outside hitter Bella Benning. Top newcomer: 5-6 sophomore middle hitter Macie Fleshner. Did you know? Junior Kate Jeffers is returning after undergoing surgery in December 2017 to correct a heart condition known as SVT (Supraventricular tachycardia) that caused her heart to beat in an irregular pattern. 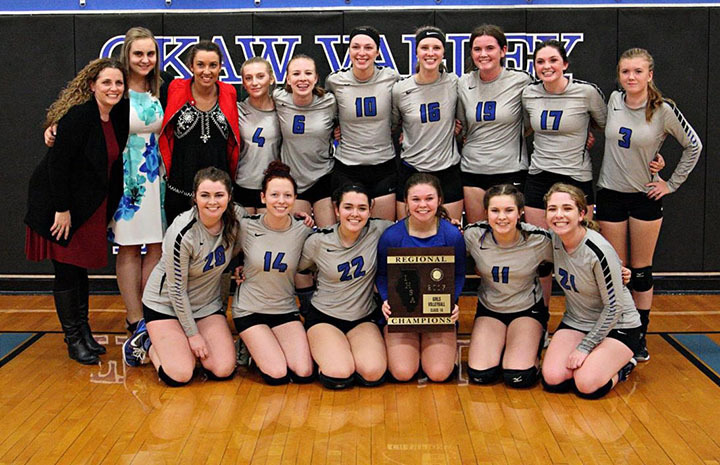 Two weeks after surgery, Kate returned as a member of the Okaw Valley girls varsity basketball team and played club volleyball for Prime Time Volleyball Club in Champaign. Last season’s highlights: 32-5-1 overall, 10-0 in conference, won the Stillman Valley tournament, lost 25-21, 25-21 to Orion in a Class 2A sectional semifinal. Top returnees: 5-11 senior rightside/outside hitter Bailey Nelson, 5-9 senior setter Jasmin Herbst, 5-7 senior defensive specialist/libero Makenna Sadler. Outlook: With six seniors returning from last year’s sectional semifinalist led by Bailey Nelson, and the addition of the foreign exchange student from Germany, Oregon will again compete for conference honors and is expected to make another long run in the state tournament. Last season’s highlights: 17-18 overall, 9-5 in conference, finished 12th at 24-team Plainfield North invite and Plainfield Central Fall Harvest Festival, lost 25-14, 25-21 to Minooka in a Class 4A regional semifinal. Top returnees: 5-9 junior outside hitter Lily Summers, 5-10 sophomore middle hitter Ariel Amaya, 6-1 junior outside hitter Ali Jansen, 6-3 junior middle hitter Gretchen Ketelhut (currently out), 5-7 junior libero Mekenzie Smith. Top newcomer: 6-2 freshman outside hitter Ella Wrobel. Outlook: The indefinite loss of Ketelhut, who was a big part of SPVB 15 Elite’s third-place summer league team and its fifth-place finish at AAUs, leaves a huge void in the middle of Plainfield North’s lineup. But Wrobel, who played part of the offseason season with SPVB 16 Elite, is a huge addition, allowing Plainfield North to contend with Plainfield Central and Minooka in the Southwest Prairie and beyond. Last season’s highlights: 15-22 overall, 5-5 in conference (third place), lost 12-25, 25-17, 25-23 to Hersey in a Class 4A regional semifinal. Top returnees: 5-8 senior setter Natalie Klancnik, 5-9 senior outside hitter Elise Kowalski, 6-0 senior middle hitter and all-conference selection Eleanor Errico (school’s single-season kill leader), 6-0 senior middle hitter Leticia Avellaneda, 5-8 senior rightside hitter/defensive specialist Caroline Slowik, 5-6 senior defensive specialist Maggie Goodwin. Top newcomers: 5-8 sophomore outside hitter Ashlyn Ryan, 5-7 junior setter/rightside hitter Erin Behls, 5-2 junior libero/defensive specialist Sophia Salemi. Coach’s quote: “We have a large returning class with four of the players being starters on last year’s team. With that being said, we will be looking for them to bring strong leadership and experience to bring to the rest of team. We anticipated big things from Eleanor Errico this season and to continue to be an offensive leader. Natalie Klancnik has been setting on the varsity court since her sophomore year, so her ability read the court and react to different situations will be a huge benefit to our team. This team is out to compete and finish strong in the Mid-Suburban League. I know for many of those girls, the semifinal regional match weighs heavy on their minds, and they are ready to go out and be competitive and leave it all out on the court. Outlook: Hersey has ruled the Mid-Suburban East for a decade-and-a-half. But Rolling Meadows proved in last year’s regional semifinal that it can push the Huskies and snap their rivals’ long conference run. Did you know? Head coach Katie Stensland is a 2009 graduate of Rolling Meadows who played collegiately at Carthage College in Kenosha, Wisconsin. “I could not be more excited to return to my alma mater to coach,” she said.